This Tour du Mont Blanc Packing List contains everything you need for your Tour du Mont Blanc hike. That’s your complete Tour du Mont Blanc packing list. Happy packing! It can also be intimidating knowing what to pack for a long distance trek – especially when you’re carrying everything yourself! It inspires awe every day as you circumnavigate Mont Blanc, the second highest mountain in Europe. If you’re planning a trip, you’ll definitely want to check out Tour du Mont Blanc: How to Plan for this Epic Adventure and the 7-day, 9-day and 10-day TMB Self-Guided and Guided Tours that we offer! This packing list will also work for our 7 and 10-day self-guided Dolomites treks. The TMB was my first real long distance hike. I had only a vague idea of what to pack since most of my other hiking trips were day hikes or just an overnight backcountry camping trip. When I first laid everything out on my bed and tried to stuff it in my backpack. A third of it didn’t fit. The next attempt, I managed to get it closed, but just barely. After strapping it up and staggering a few steps, and realized that if I was having a hard time making it across my bedroom, I had no chance of making it 160km across mountain passes every day. Reflecting on my TMB afterwards I probably overpacked a tiny bit. But was overall happy with my packing list. I’ve modified this packing list to reflect what you actually need. This TMB Packing List assumes that you will be staying in refuges, and taking between 7 – 12 days to do the hike, as I did when I hiked the TMB. If you plan to sleep in a tent, of course, you would need camping gear. You’d also need to decide whether you would be cooking your own food or eating at a nearby refuge. It also assumes that you will be carrying your own backpack. You’ll need a 60-L backpack. If you pack really light you can get away with a 45-litre backpack, which I used. If you don’t want to carry your own backpack, then I highly recommend doing one of our self-guided tours. We can organize luggage transfer for you so that you just have to carry your day backpack. If you’re having your luggage transferred daily, a 35-L backpack is fine. 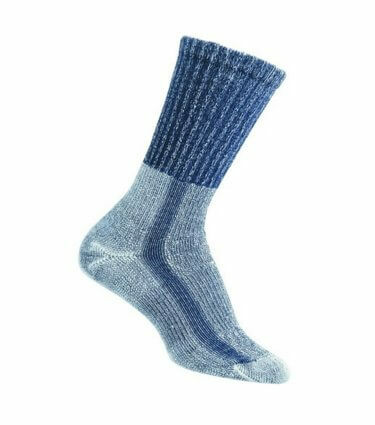 Smartwool top. It repels odour. And you can actually wear it multiple days without washing it and it really doesn’t smell, wicks away moisture and dries quickly. It’s also really soft on the skin. 2 Quick-dry moisture-wicking shirts – 2 is enough if they are long sleeved with the option to roll the sleeves up, otherwise, bring 2 short-sleeve and 1 long-sleeve shirt. 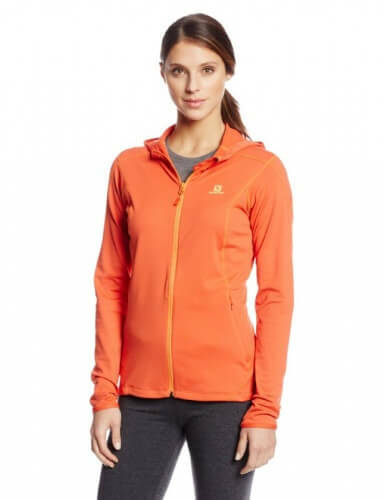 Lightweight fleece with hood or another warm layer. Choose on that’s lightweight and warm. Waterproof shell with hood. It will likely rain at some point while you’re hiking the TMB. Shells don’t take up much room. Waterproof pants. I only wore mine one day but was glad to have them. 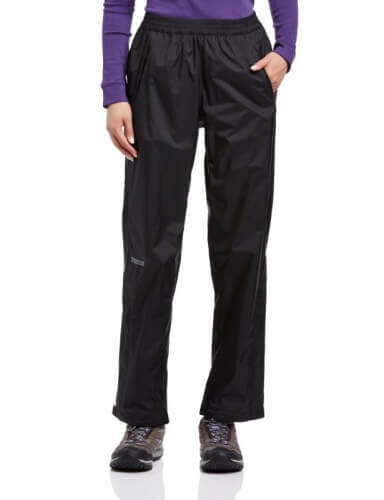 2 pairs of Convertible hiking pants – Look for the kind that zip off into shorts. This saves you from having to bring both pants and shorts. Thermal leggings – You’ll want to bring these if you’re hiking the TMB in June or September. Light gloves – If you’re going in July and August, light gloves are fine but if you’re going in June or Sep, then bring warmer ones as well. Neck warmer – This is one of my favourite pieces of gear and takes up almost no space. Dry Bag For your electronics and passport. Anti-shock & retractable hiking poles – To reduce the pressure off your lower body. Buy the retractable kind so that you can carry them on your backpack when you’re not using them. Hiking boots – Choose an ankle-height pair that is waterproof or water resistant. VERY IMPORTANT: Be sure to break them in before you start the Tour du Mont Blanc. You don’t want to be in constant agony because of blisters. 35-45L Backpack. The size you choose will depend on how much you pack. Look for one that has a built-in rain cover. 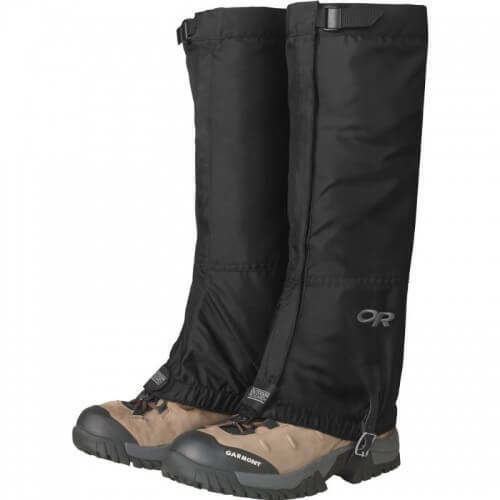 Gaiters – Very useful in case of rain or walking through deep snow banks. 3 pairs of quick dry underwear. They save a lot of space by not having to bring so many pairs. Sports bra and a regular bra for hanging out at the hut. You don’t want to have to put on a sweaty bra after showering, yuck. Baseball or sun cap – Something to keep the sun off. Hut shoes – Many huts do not allow regular shoes in certain areas. Bring a pair of hut shoes, spa shoes, or slippers to wear indoors. Some, but not all huts will provide these. Nightshirt or something to sleep in – You may be sharing a room with others. Even if you have your own private room, you will be sharing a bathroom, so bring something that covers everything. I.e. leave the negligee at home. ALPS Mountaineering MicroFiber Rectangle Sleeping Bag Liner – The refuges provide blankets and a pillow. A sleeping bag liner serves as a barrier between you and the blankets. Bring this even if you’re staying in private rooms since some but not all accommodations provide linens. Comfortable pair of casual pants that you’ll wear after hiking and having dinner in the refuges. Nutritious Snacks that don’t squish easily. Nuts and dried fruit are good choices. Crackers and wafers get crushed easy and chocolate melts. If you crave something sweet, then gummy bears are a better choice than chocolate since they don’t melt. If you have any food allergies, like me, I’m Celiac so can’t eat any gluten, then bring a few extra snacks in case the refuges aren’t able to accommodate your allergy or forget, as happened to me on a couple of occasions. Note: Breakfast and dinner are both served in the refuge. You have the option to purchase a to-go lunch from them which is what we did. The other option is to bring more food or plan to stop at one of the refuges en route for lunch. If you choose the last option, prepare to do more route planning so that you don’t end up eating lunch at 10:00 am or 4:00 pm. 4 liters of water – Some days you may only need 3 litres, and on most days there will be a refuge en route where you can fill up your water bottle. Electrolyte tablets – These are very helpful near the end of the day when you’re ready to power out, but still have more hiking to do. Compeed blister cushions – THE best blister treatment I’ve ever found. Quick-dry towel – Most refuges don’t provide towels, so you need one you can dry off with after a shower, and use to dry your face. Tour of Mont Blanc: Complete two-way trekking guide. You won’t need this or the map below if you choose to do our TMB Tour. Universal Travel Adapter. You’ll need an adapter that works in Europe and that has multiple outlets. Outlets are in short supply in the huts and this one allows you to charge multiple devices at the same time. Most refuges do not accept credit cards and there are only cash machines in the towns. Of which you will not be in every day if you stay in refuges. Be sure to bring enough cash with you. You can expect to pay €12 – €15 for a packed lunch from the huts. You’ll also need money for drinks at your hut. And for tranfers, if you want to take a lift or a bus to shorten your hike. Budget ~€30 to €50 for this. Plus it’s a good idea to bring extra cash as a contingency. In Europe, it’s required by law that you carry identification with you. If you’re a European citizen identification will do. If you’re not European, you must carry your passport with you. Book to read. I recommend bringing both a Kindle Fire HD – pre-loaded and a small paper one. Plugins are in short supply in refuges and you may not be able to charge all your devices every night. Camera or phone with a good camera like an iPhone or Android phone. 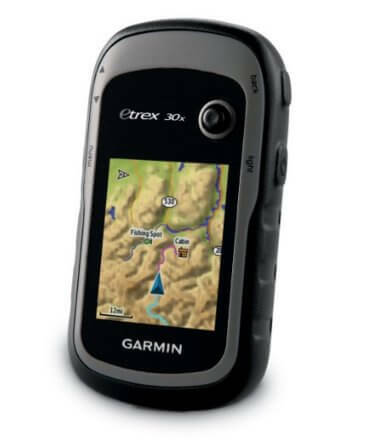 Garmin eTrex 30x to track your route and progress. Alternatively, you can download an app and do this from your phone. Massage Ball – I highly recommend bringing a small one that you can use on your feet, aching shoulders, and legs. It doesn’t take up much room and feels soooo good. Card Game. You may have time to relax when you arrive at the hut each day. Bring a card game or other game that doesn’t take up much space. Pictured is one of my favourites. Eye mask and ear plugs. While it’s lights out fairly early in the dormitory rooms, there’s usually at least one person snoring. Disclosure: This post includes affiliate links meaning that if you buy something I receive a small commission at no additional cost to you. I’ve included recommendations for specific products after receiving multiple emails asking for product recommendations. Next postMeteora: THE Place to See a Unique Hidden Monk Jail! This mountain trek is a beautiful but grueling one ... these items will see a novice hiker through this experience with a decent amount of comfort. Great list! @Noah - Agreed! Thanks for your comment! Hi Laurel , Awesome detailed explanation about TMB. We are Planning to do TMB this year (Camping). Can you please shed some light on Camping? Is it possible ?feasible? @Samir - Thank you! Yes, it's possible to camp, but you can't pre-book. From what I understand it can be difficult to get a spot, so try to arrive early in the day. It may also be possible to shower or have dinner at the refuges, if they have room, but you have to inquire individually at each one. Unfortunately, I don't have more info on camping, as we stayed in the refuges. This is what i've been looking for. Thanks for the list, Laurel. So glad that it was useful! What kind of adapter should I bring for phone and camera? @ Kate, I would recommend something like: if it's just for your phone or camera, or a more general adaptor, like this one: http://bit.ly/1USiFLS. Hope that helps. The best packing list I found online. Thanks. @Marilou - Thanks so much! Hi Shell, Glad that you found it useful. If you haven't paid for your accommodations yet, you'll need to bring enough to cover that as most places don't accept credit/debit cards. In addition, if you want a packed lunch or to eat at one of the huts en route that's ~ €8 to €12 a day. We also brought all our snacks with us. I'd also bring another €200 - 300 or so on top of that as a contingency fund. I.e. we didn't like the look of one hostel so we ended up booking a private dorm room instead. Hope that helps. Enjoy your trip! Hi Samir, I did TMB on mountain bike in self autonomie in 4 days. We were camping " wild". As soon as you put your tente up quite late and quite hiden and you fold it up soon you will be ok to do it too. Of course you must clean the place up but I am sûre you would!!! @Blanka - Thanks for your help in answering Samir's question, I appreciate it. Hi Laurel. Were you able to pack everything in a 35-litre backpack? Hi Cecilia, I was able to get everything into a 45-litre backpack, and then carried my lunchpack and flip flops on the outside of my backpack. My husband had more stuff, and had a 60-litre backpack, which still had space left in it. This is great information - thank you. I am leaving for my hike in 28 days. Do you know of a site where you are able to plan day by day, stop by stop to know the distances and elevations? I found one, however it isn't in English. Thanks of your help. @Lori I kept them in my backpack and either my husband or I stayed with it the entire time. I brought a small bag with my wallet, passport, etc. with me to dinner since I didn't want to leave it in the shared rooms. Best of luck and let me know how your trip goes! I loved the TMB! @Eran, correct, you don't need a sleeping bag, BUT you do need a sleeping bag liner. You'll sleep in that, cover the pillow with it, and then use the hut blankets over your sleeping bag liner. @Sri - I am working with a tour operator who's fantastic. As soon as I have their pricing for 2017, I'll be in touch. Thanks for your interest. Thanks, will wait to hear from you. Hi, Thank you for such a great list and so much useful information! We are planning on doing the hike with some friends Sept 2017. I would love to have your tour operator's information as well. We were planning on doing the route on our own, but your recommendation of getting the extra help for booking is very intriguing. Thanks again! @Erika - So glad that you found it useful. Here's the link to the self-guided tours. After having done the TMB by ourselves, I've since booked all my treks as self-guided tours. I love the freedom without the hassle, making reservations and extensive planning. @Anna - Great to hear that you're interested in doing the TMB. You can find our self-guided tours here: https://monkeysandmountains.com/tour-du-mont-blanc-self-guided-tour/. I'm a big fan of self-guided tours as you get the freedom, without the hassle of making all the reservations and can we can provide you with advice both prior and while on your tour. Hi Laurel, Thanks for all the guides and recommendations about Mont Blanc. Are there anymore websites that do all the self guided bookings? I have not been able to find any in my research so far. I want to do it solo and there is no option for that in the link you provided. @P - My company organises self-guided tours; https://monkeysandmountains.com/tour-du-mont-blanc-self-guided-tour but our insurance requires us to have 2 or more hikers. There could be some co. that organize self-guided tours for one person but I'm not aware if there are. @Dennis - Glad it was useful. I charged my phone every day but there was often only one charger in a room, so you have to share it, i.e. you can probably get a couple of hours of charging but not a full night. It's also challenging if you need to charge multiple devices so it's a good idea to bring an adaptor that allows you to charge more than one device. Enjoy your trek! @Jess - I didn't weigh it, but if you're also going camping it's definitely possible to do so and there's a few places along the way that you could stock up on food that would keep your pack lighter. Enjoy! Laurel, im planning our trip for july of this year. we would like to do a self guided tour. would you pass along your recommendation for a reputable company. Thanks, your packing list is so complete and helpful !!!! @Hunter Glad that you found it useful. We do have a list of huts that we recommend but we reserve this for our clients who do our self-guided tours which you can find here: https://monkeysandmountains.com/tour-du-mont-blanc-self-guided-tour. I definitely recommend booking as far in advance as possible. Some of the private double accommodation is already full for July and August. Hello! Thank you for the helpful article. I have been researching this trek for months when I decided to go, and I'm leaving​ in two days! I am looking to purchase the trail directions that are provided by self tour company, not the entire booking service. Is that a possiblity? I'm just a touch worried about getting lost in the wilderness by myself! Also, because I am by myself, I plan to cover more country and complete the tour in six days. Please message me! @Shelly - Great to hear that you're doing the TMB. It's a fantastic tour. We only provide the detailed day-day instructions to clients who book the self-guided tour. I'd recommend a good map, and bringing a mobile phone. Best of luck. @Lauren - You need to notify the refuges in advance otherwise it will be much more difficult. (Our tour company does this when we make the reservation). Even with doing so, there were 2 times I only got a salad for dinner which wasn't exactly filling after hiking all day. For the packed lunches, they don't have gluten-free bread so I often got 4 apples as a lunch. I'd bring extra protein bars/snacks as a backup. Hope that helps. @Betsy - thank you for kind words and recommendation. I haven't tried a pStyle but am curious to try it now. Thanks for the recommendation.